Originally published under the title "Turkey's Oppression Machine." 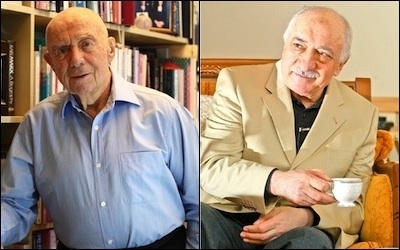 Ishak Alaton (left), a 90-year-old Turkish Jewish industrialist, is being investigated on charges of "supporting terror" for providing financial and moral support to Fethullah Gulen (right), a U.S.-based political rival of Turkey's president. It was 1942 when, one day, Hayim Alaton, a Jewish yarn importer in Istanbul, received two payment notices from the tax office: He was asked to pay 80,000 liras in total -- a fortune at that time. He ran to the tax office to object, but was told to pay the whole amount within 15 days. It was the infamous Wealth Tax, passed on Nov. 11, 1942 and it remained in effect for a year and a half until it was repealed on March 14, 1944. The Wealth Tax exclusively targeted Turkey's non-Muslims at a time when 300,000 Orthodox Greeks and 100,000 Jews were living in Istanbul (where total population was one million). The law stated that the homes and workplaces of those non-Muslims who could not afford the tax would be sequestered. Alaton was able to pay no more than 11,000 liras. That was the start of "black years," as Alaton's son, 15 years old at that time, would later recall. Before long, the Alaton's home and store were sequestered. The merchandise in the store and the goods in stock were sold at auction. Every item in the Alaton home, including kitchen utensils, bed frames and lamps were seized and sold too. The family of six was left only with mattresses. In later days, Alaton was taken from his home and sent to a tent camp in Istanbul where he was kept for two months. There were no meals, so his children would bring him whatever food they could find. One day the 15-year-old Ishak went to the camp and saw his father's tent empty. The Turkish authorities had put Alaton, along with many others, on a train bound for the town of Askale, in eastern Turkey, where the non-Muslims would be forced to perform physical labor, in this instance, cutting stones on a hill. Alaton would stay in the forced-labor camp for two hard winters and one summer. The family would not hear from him for a year. During that time, the bodies of 20 laborers at Askale were sent home. Ishak recalls his father's return: "One evening, there was a knock on our door and an aged, wretched beggar stepped in. We wondered who he was and looked at him with curiosity. When he started to speak, we knew from his voice that he was my father." By that time, the family business had gone bankrupt and Alaton, in the grip of a crippling depression, could not leave home. He died running a small store where he sold a small inventory of imported goods. Under AKP rule, non-Muslims have experienced systematic government intimidation. In a 2011 interview, Hayim Alaton's son, Ishak, who, after turbulent years in his youth, would found one of Turkey's most successful industrial conglomerates, would praise Turkey's ruling Islamists, the Justice and Development Party (AKP) by saying "the AKP has taken many positive steps to improve the situation of non-Muslim minorities." Unfortunately, that was a premature conclusion, as the younger Alaton would learn four years later. Under the AKP rule, Turkey's dwindling Jewish community, now at around a mere 17,000, as well as other non-Muslims, have come under systematic intimidation from government politicians and bureaucrats. These non-Muslim minorities are also often the targets of racist attacks. Now 90, Ishak Alaton, although widely respected as "a man of wisdom" by the Turks -- Jews, Christians and Muslims alike -- is under scrutiny on charges of supporting terror. An Ankara prosecutor is inspecting claims that Alaton has provided financial and moral support to what the state bureaucracy calls "the parallel structure" -- a movement led by an influential U.S.-based Muslim cleric, Fethullah Gulen. Gulen and his movement were staunch AKP allies until the end of 2013, when the two engaged in an all-out war. The Gulenists accuse Turkey's President Recep Tayyip Erdogan and the AKP of autocratic rule and corruption, and the Turkish government has declared the Gulenists a terror organization that aims to topple the government. The charges against Alaton are based on his 2013 biography, Unnecessary Man, and were leveled after a former colleague of Alaton's filed a criminal complaint against him. Some passages in the book refer to Alaton's support for the Gulen movement schools outside Turkey, particularly one in Moscow. The probe has been ongoing for about a year. When it comes to persecution Turkey's state machinery never changes.